A recent article in The New York Times featured a story on the new film version of Jane Eyre directed by Cary Fukunaga. Charlotte Brontë’s novel, first published in 1847, has been filmed at least 18 times, according to Charles McGrath, the author of the Times piece. Brontë’s classic Gothic romance set the standard, and in many cases the rules, for romantic literature. So it isn’t hard to understand why the story of a poor orphan girl who ultimately finds love and happiness has fascinated filmmakers and filmgoers alike for generations. 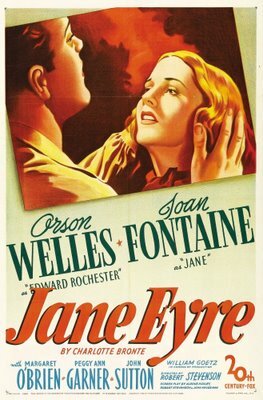 It’s interesting to note that Fukunaga grew up watching the 1943 film version directed by Robert Stevenson starring Orson Welles as Rochester and Joan Fontaine as Jane. Like Fukunaga’s version, it’s not a strict adaptation of the novel. The screenplay written by Aldous Huxley, John Houseman, and Stevenson has a literary quality that captures both the novel’s spirit and tone. That literary quality is bolstered by the extraordinary black and white cinematography by George Barnes, who framed every scene as if it were a painting. 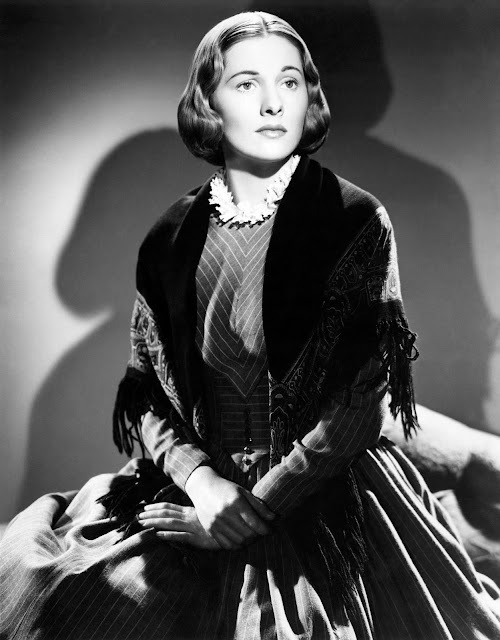 Although her looks were downplayed, Joan Fontaine still made a beautiful Jane Eyre. When Jane becomes an adult (Fontaine), she decides to make her own way in the world as a governess. 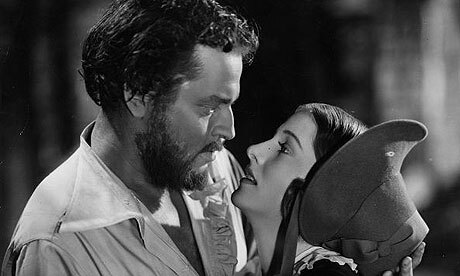 When she arrives at Thornfield Hall, Jane is overwhelmed by the estate, but intrigued by her new master, Mr. Rochester (Welles). Hired as a governess for Adele Varens (Margaret O’Brien), Jane is conscientious and caring. The studio reused old sets and props to give Jane Eyre its rich look. The film shot during World War II was constrained by the budget limitations that the studio imposed on the production team. By recycling older sets and using props and furnishings on hand at Twentieth Century Fox, the producers created an atmosphere that is both lush and mysterious. The deep shadows and sharp focus give the film its unique texture; it’s the Hollywood dream factory at its creative peak. The movie title in the opening credits was stamped on a book. Part of the appeal of the novel is the voice of the narrator, Jane. 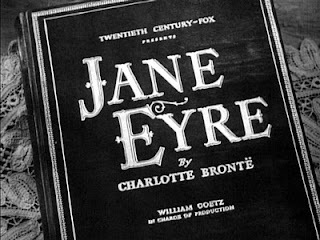 The 1943 film starts out with a shot of the first page of Jane Eyre with Fontaine’s voice-over reading of the text. Unlike the novel, where Jane is clearly the main character, Rochester is given almost equal status in the Stevenson version. 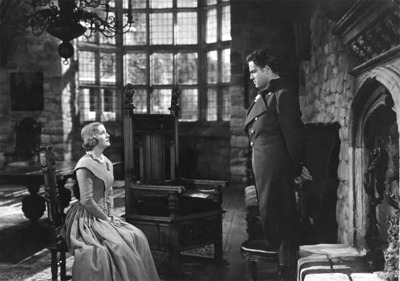 As played by Welles, Brontë’s brooding hero is bigger than life; if he had been paired with a less competent actress, his characterization might have overshadowed Fontaine's Jane. 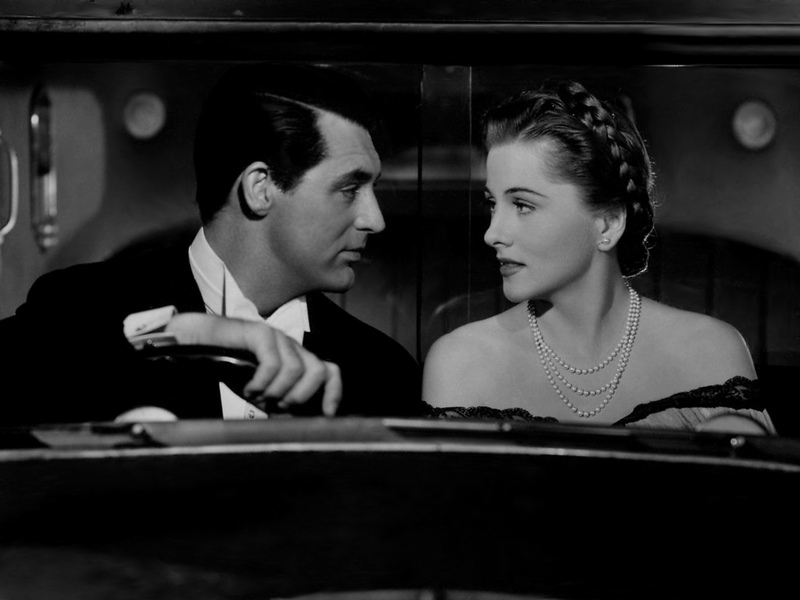 Joan Fontaine won an Academy Award for her role in Suspicion costarring Cary Grant. Jane Eyre was Fontaine’s fourth major film role after her breakout performance in Alfred Hitchcock’s Rebecca (1940). An Oscar winner for another Hitchcock classic, Suspicion (1941), Fontaine’s career was flying high. Welles on the other hand was no longer the boy wonder of Hollywood. RKO suspended his contract, which almost put it out of business. Welles’s overspending on the back-to-back financial failures Citizen Kane and The Magnificent Ambersons greatly lowered his marketability in Hollywood. It’s somewhat amazing that he was offered the role of Rochester and even more amazing that he would get top billing over the more famous Fontaine, who played the title character! Much has been said about Welles’s influence on the film’s production, some suggesting that he was really the director. According to Fontaine's memoir, No Bed of Roses she discounted that notion. Fontaine said that slowly, but surely, Stevenson took charge of the film in spite of Welles’s attempts to run the show. 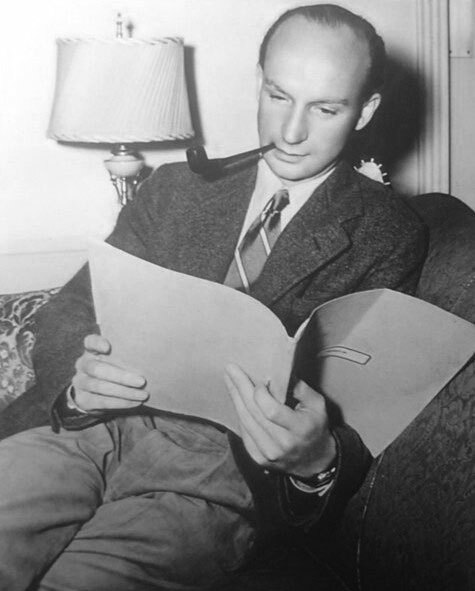 Stevenson had a distinguished directorial career that goes back to the early 1930s. His films from the studio period include the 1941 version of Back Street starring Charles Boyer and Margaret Sullavan. He directed many major movie stars including the likes of Robert Mitchum and Ava Gardner. Stevenson really hit his stride when he signed on with Walt Disney. Stevenson’s first three films for Disney are considered classics, including Johnny Tremain and Old Yeller (both 1957) and Darby O’Gill and the Little People (1959), which featured a young Sean Connery. He reached his box office and creative peak with the Oscar-winning Mary Poppins (1964). Stevenson’s output at Disney made him one of the most commercially successful directors during the 1960s and 1970s. I think the reason the Stevenson version is so successful is the way it expresses the longing and yearning of the main characters in their search for love and acceptance. Fontaine’s Jane is vulnerable, but strong; you identify with her ultimate goodness of character. Through Fontaine’s characterization her yearning becomes our yearning; we want her to find happiness. If Welles’s Rochester is a bit over-the-top, Fontaine’s more subtle performance evens things out. In spite of the overpowering Welles, it’s still Fontaine’s picture. 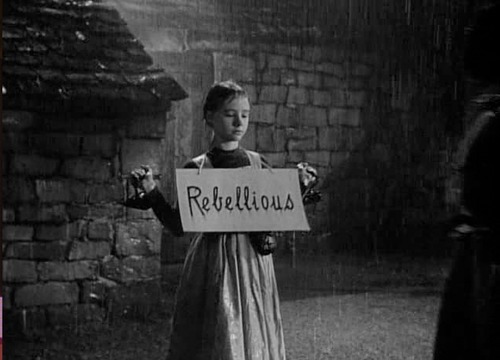 Jane Eyre is the star and we do love Jane.